Big Daddy (Eddie Levi Lee) confronts his son, Brick (Rick Prigge), about his drinking problems in Montana Repertory Theatre’s production of Cat on a Hot Tin Roof. Greg Johnson left a prospering theater career in New York to come lead the Montana Repertory Theatre in 1990. One of the first things Johnson did was call Jim Caron at Missoula Children’s Theatre to ask if he’d share his list of local sponsors across the country. Caron was kind. Johnson sat at his desk and started dialing. He sat there for two weeks selling the Rep’s upcoming show, The Voice of the Prairie. It’s a much different story today. With the troupe not even halfway through its 2008 tour of Cat on a Hot Tin Roof, its 2009 schedule is already sold out—oversold, in fact. The Rep is filling its houses from Sheridan, Wyoming, to Key Largo, Florida. It raises 75 to 80 percent of its budget in tour fees, a rare feat. Its artistic mission is intact. Rick Prigge is feeling the luck of the Rep these days, too. When the Butte native heard that Johnson and the Rep were planning to tour Tennessee Williams’ great play about family and suffering, Cat on a Hot Tin Roof, for the company’s fortieth season, he had to be part of it. The Rep is Prigge’s home theater company, the place where he sat in the dark as a young acting student at UM and watched professionals put on a show. There he learned the difference between the fearful first efforts of a young actor and the bold daring of professionals. He earned his undergraduate degree and was a year out of graduate school at the University of California, Irvine, working in theater in Los Angeles when he heard about Cat. In the ten-person cast, maybe three characters are suited for a young man. One is the lead character, Brick. Prigge is part of a tour that left February 9 and performed its last show on April 27 in Lexington, Kentucky. The company—seventeen people with a set and equipment in two trucks and three vans—will have worked a two-week run in Missoula and then put up the show sixty-five times across the country. In Prigge’s hometown of Butte, they drew 1,000 people to the Mother Lode Theatre. It was Prigge’s mother’s birthday, it was the Rep’s fortieth birthday, and he couldn’t have been happier. The tour launched Prigge to union-actor status. One of five Actors’ Equity Association members on the trip, the twenty-seven-year-old is fast becoming one of the professional company’s mentoring actors, like the ones who taught him. That chain of experience has become a hallmark of the Rep: Audiences see great American plays. UM spreads its name and reputation. The Equity actors get to work. And the students learn what the theater life and craft are all about, says Johnson. The Rep today enjoys the success its founders prayed for forty years ago. Four decades of sweat and tinkering have produced the formula that works: A mixed company of professionals and students tour the country performing one classic American play. No musicals. The company works hand-in-glove with the UM Department of Drama/Dance, which provides its home, its technicians, its scene shop, and some staff. The Rep does outreach with an educational tour in the fall, The Colony playwrights’ festival and the local company Montana Rep Missoula. Fewer than a handful of companies in the United States do what the Rep does. And virtually no one makes it work financially the way The Rep does, earning three-quarters of its budget on the road. This year, the company will bring in $500,000. Its $800,000 budget includes only $15,000 in grants. Its 2009 tour of Harper Lee’s To Kill a Mockingbird is already booked from January through May with more than seventy performances. From the actor’s perspective, Prigge sees that work every night. The ever-touring musicals of other companies are great entertainment. 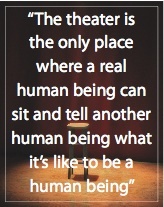 But American audiences are hungry for thought-provoking works that explore what it means to be human. Johnson gives credit to Rena Shagan, president of Rena Shagan Associates Inc. of New York, a leading arts management agency. Shagan has booked the Rep tour for the past fourteen years and has “changed the complexion of the company,” he says. Shagan took on the Rep when it was trying to do two shows per tour and had a smaller geographic reach. She advised paring down to one show and expanded the range. That has brought in presenters who can pay enough to support the Montana leg of the tour. “They understood themselves artistically, and we have a good handle on the market,” Shagan says. Shagan consults on the choice of shows, helping the company stick to its artistic mission while choosing plays that work in the marketplace. 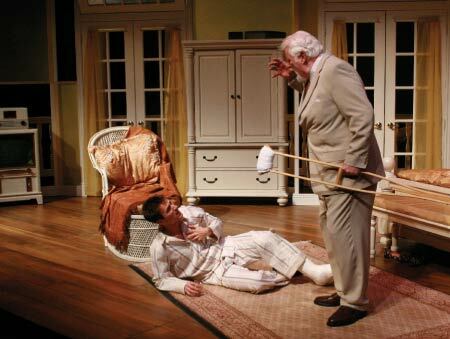 Dr. Baugh (played by Jack Zagunis) and Reverend Tooker (Garret Burreson) hold back a crying Big Mama (Jayne Muirhead) in Montana Repertory Theatre’s 2008 production of Cat On A Hot Tin Roof. Bottom: Maggie (portrayed by Heather Benton) attempts, yet again, to seduce her aloof husband, Brick (Rick Prigge), and convince him they should conceive a baby in order to secure his inheritance in Cat. The Rep’s artistic vision goes back to the very beginning of the company and its founder Firman H. “Bo” Brown. Montana’s theater tradition began with the companies that visited mining camps and frontier outposts by stagecoach and steamboat beginning in the 1870s. UM included theater on campus since its beginning in 1893. Theater declined after the Depression, but the post-World War II education boom brought new interest. Regional theater flourished. Brown, who graduated with a journalism degree in 1949 and worked in theater during and after college, joined the UM drama faculty during that era and became chairman a year later in 1957. Brown and his wife, Margery, started the Bigfork Summer Playhouse in 1960 and ran it for seven years. But Brown’s interest kept coming back to what he could do in Missoula. Brown, who’s now retired in Missoula, lobbied the brand-new Montana Arts Council and snagged $12,000 of the first $40,000 it had to give. The people Brown knew from his school days had gone back to their hometowns around Montana. Brown worked the phones and drummed up a tour. “I could sit in Missoula and call people all over the state and say, ‘We want to come there. Can you see if your club would sponsor us?’ It worked very well. That network is what still makes everything work,” he says. The young company put up Oliver Goldsmith’s She Stoops To Conquer in the fall of 1968, then George Bernard Shaw’s The Devil’s Disciple in December, then performed them in February in Missoula with William Shakespeare’s Julius Caesar. In March, they did twenty-four performances in twenty-four days in nine Montana towns and one each in Idaho and Utah. Fifteen thousand people saw the shows. Brown liked to create things, not grow them for years, he says of himself, and he wasn’t a money man. In 1969, he went to a new job at Ithaca College in New York. He knew the Rep would be challenged, but he thought it would prevail. Without Brown’s vision and energy, the Rep stumbled through the 1970s. What shows should it perform? Who should perform them? Where should they tour? “They went to several different models trying to make it work,” says Steve Wing, the Rep’s production manager. Wing started managing the Rep as a graduate student in 1978. Drama department chairman Jim Kriley had arrived two years before, and Kriley was determined to make the Rep work. He took the company professional in 1978, a big milestone, and he renewed and stabilized it artistically through the 1980s, but money was always a problem. UM graduate Helen “Gus” Guthrie Miller '60 of Butte was on the statewide advisory board Kriley started for the Rep in 1980. Fundraising was one of its charges. When Johnson arrived in 1990, there was doubt the company would survive because of money woes. On the last day of the 1991 session of the state Legislature, then-Missoula legislators Mike Kadas and Fred Van Valkenburg pulled off a $70,000 appropriation. “That saved the Rep,” Wing says. Johnson brought a background in New York theater and a shipbuilding-family constitution to the company. Wing, who wrote his master’s thesis on the Rep in 1982 and accompanied the tour for years, is the resident historian of the company. He can tell about the time the briefcase with the actors’ paychecks and $1,800 was stolen in Tacoma. And the time he and another company member fixed the broken-down van on a mountain pass in Oregon, then discovered they had left the back doors open and strewn luggage for ten miles. Once the driver of the truck on the Cowboy tour didn’t realize he’d scraped off forty feet of awning from the company’s motel. Actors have quit on the spur of the moment, had open-heart surgery, fallen asleep on stage, fallen off the stage, and landed in jail during a night out. A tragic highway accident resulted in the death of an actress. Throughout, the Rep has launched hundreds of careers. And it’s kept Wing’s interest. His job is the same, but every tour is different. The people are interesting, and the problems are challenging, he says. Ginny Merriam ’86 is a freelance journalist who lives in Missoula. An award-winning reporter for the Missoulian for twenty years, she currently is the communications director for the City of Missoula.